So this is my first attempt to contribute some graphics to the wonderful pak. Attached is an immage of a modern shop-and-office-building. you will realise, the roof is yet missing, and honestly, i'm not sure what i should do with it. I'd like you to critisize my work and maybe give me some help/assistance on how to improve this one. But the Roof need another color. Looking good so far! I have not looked over the file in detail, so there might be latent techincal or scale issues, but, apart from the roof, the building looks good. The roof ought, as Greenling suggests, be a different (darker) colour, preferably a charcoal tone mottled with dirt. I suggest adding detail to look like air conditioning units and lift machinary on the top. Have a look at photographs of real buildings' roofs for inspiration. Ahh, that's much better! Have you tried to get it into the game yet? Do you know how to produce multiple rotations...? I'd say it looks pretty good. edit: found what's been wrong. 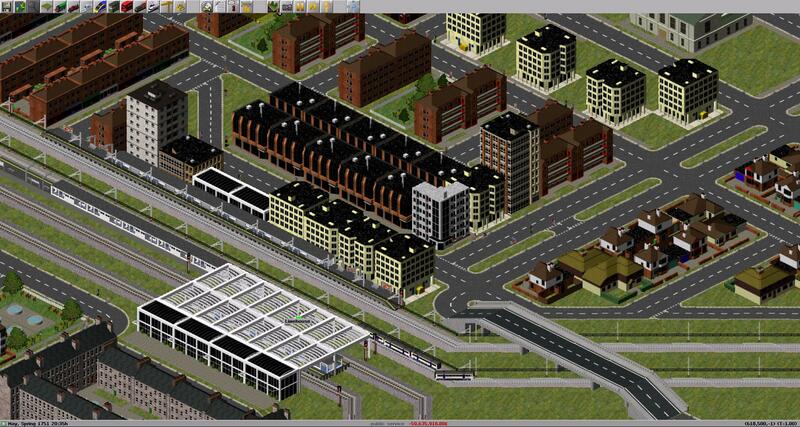 here is the result of my work, managed to get it into simutrans. People sometimes go wild with bright and hot colors. While the building seems okay alone, it looks unfitting among other buildings in the game. The Secend Photo from the Buliding looks better out! Thanks for the criticism so far. @Igor: Do you think i should do the colors a bit darker? The building itself is really good - definitely fits the pak. I've noticed though that the pavement isn't quite right - there is a pavement texture which can be imported from blends which use it (compare with the base of the 1930s buildings in your screenshot above). I'd be very happy to include it once that is fixed. Thanks for the praise! Im totally surprised you want it in the pak. Just tell me which files you need, i'll release it for free use, no sale, please give credit. 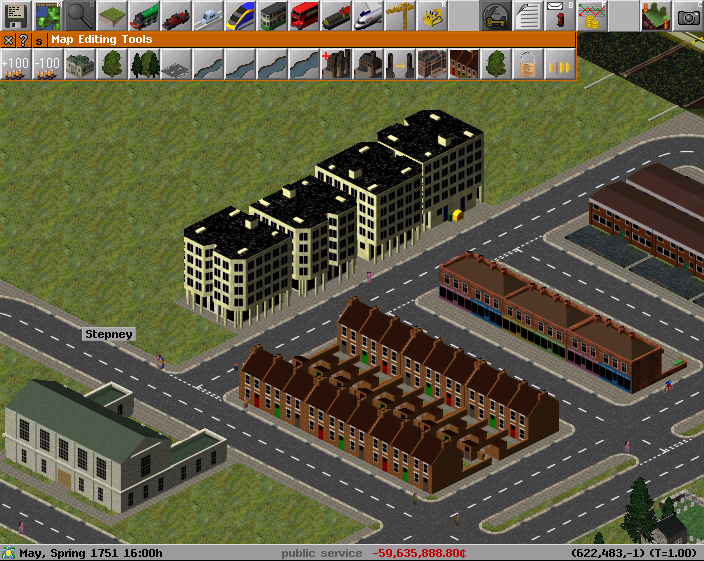 Attached is an in-game image with the "new" pavement. Excellent. The pngs and dats are all I need. i'll release it for free use, no sale, please give credit. Just to clarify this to make sure that the pakset's licensing terms are properly synchronised, as the pakset uses open source licensing: are you happy to release your work under the Artistic Licence under which the rest of the pakset is released? Its terms seem quite similar to what you want to achieve, but it is a recognised specific licence that goes into full detail (and also permits modification). No. When I said "While the building seems okay alone, it looks unfitting among other buildings in the game", I wasn't talking about your building, but about other people's first attempts on painting a building. While png and dat are all that are strictly needed the blend file and any texture images required are also helpful. @TheHood: Artistic License is fine for me. @kierongreen: Is there an e-mail adress/anything else i can send all the stuff to in order to make it available for you? The files are way too big to attach them in the forum. I've got an email address listed in forum profile - I can forward email onto jamespetts and The Hood to put on svn/git as they have access (or you could ask them for their emails directly). Would the blend and other files also be released under the Artistic Licence also? Alternatively, you can get a Dropbox account and upload all your files into the 'public' folder. All you have to do is then give links to them Its all free! did not realize this is a first attempt, until i scrolled up. I thought the people with lots of routine creating pak-britain buildings did it. In other words: Impressive! Well, thanks for the praise! Of course, the .blend, the .png, the .dat and all other files, including screenshots are free under artistic license. This is not only for the building i did now, but for all future releases which might come somewhen. Fantastic - one thing I've just noticed though is that there are currently no snow images for the new building. Having spent ages making snow images for all existing buildings I'm only including new buildings which have snow images included. Any chance you could do these? PS looking forward to any future creations! Well, i'll do the Snow Images sometime this week. Change the flat part of the roof...you could give it a low gable and then you would effectively have what we commonly refer to here as a button roof. Originally they were pretty much only used for barns but are very common for houses now. The porch, both the roof and support members seem a little heavy to me. Maybe you could make that ledge or balcony a little wider and perhaps put a railing around it? Thanks for the suggestions, Roads! Well, i widened the balcony, and made the porch a bit smaller, yet i can't figure out what you mean by a button roof. not even google seems to know it, so could you maybe give me an image of what a button roof looks like? Sure. I'll draw one very simply and upload it. right now. I'll try again later. I said it was rough, didn't I? Assuming it's a modern-ish building, some air-conditioning units and maybe even aerials on the roof would probably fit. The floors also possibly look a little high as well, especially the top floor. Otherwise, it's excellent work! Modified it a bit, so that it looks more complete. Added some railings to the balcony, and some stuff on the roof. Also scaled down the height of the rooms. @Roads: Thanks for the drawing, i tried this type of roof, but don't think it fits to the idea i had. Most propably i'll use it in some of my future creations. Textures and so on look good, but I'm not sure what this is meant to be? The windows are very uniform (apart from the balcony - also those on the right seem to have no frames) making it seem like some offices. The overall shape with the flat room in the middle is more industrial looking, although the white lower texture doesn't match that. On the otherhand the porch and textures remind me of some blocks of flats, but the window spacing and sizes don't fit this as well... I'm unclear which option the roof furniture matches, if there are chimneys these are more often put at the ends of buildings. Is this based on a real world building? Well I'm not sure what it looks like but I know what it would be perfect for - a brothel! The ladies could advertise from the balcony. It looks enough like an industrial building so it would not be suspect as a place for those with a taste for the seedier side of life. Looks like to me it would be perfect for one of those districts a lot of cities have - between the nicer part of town and the industrial area. Modify: After thinking about this some I realize people might not want a brothel in their game. My sons often remind me I'm a one percenter and that means 99% of people do not often share my likes and dislikes. With that in mind, I think your building has the potential to be a great building for professional people, i.e., doctors, lawyers, etc. I love the color of the upper floors and the roof. I would discard the porch and the balcony and make the doors on the 3rd floor windows like the rest. I would change the bottom color to match the top. You might add some trim between the floors if the building looks too plain. Something like you already have between the 2nd and 3rd floor. I would try adding a couple lines in that gray band so it doesn't look like just a painted band around the building. Then I would add two front doors with quite a bit of trim around them to make them stand out. You might also put a discrete little sign over the top of each door. Top floor looks like a hotel ballroom, but for such the building is a bit too small. Reminds me a bit of luxurious Lofts, from a retrofitted industrial building. Here in Toronto are a couple of those, i assume when they were built in late 19th century for the fur-coat industry they did not look very different from the homeland. (The top windows would be a new addition, to make Arteliers or more expensive Lofts. In other words, standing on the flat part, there would be a something like a parapet, at it's top edge the incline of the roof would start. The inner wall around the flat centre might be as high as a normal storey. If you do decide to use the building as a brothel, I have a story to go along with it. This brothel claims to be the best little whorehouse in Britian. A young lady named Fancy McPeters works there and everyone says she looks just like Dolly Parton. When asked why she was employed at such an establishment, she replied, "it costs a lot to look this cheap." If y'all think this is a slur on Dolly, it is not. That is precisely what she said about herself on Larry King one night.